BLAEU, Johannes & BLAEU, Willem. Champagne latine Campania, Comitatus. Copper plate engraving with original hand coloring. Image measures 15″ x 19.5″. This incredible map by Willem and Johannes Blaeu dates to circa 1640. Featuring the famous French wine making region of Champagne, the map labels numerous villages, towns, rivers, and important cities including Chalons, Reims, Vitry-le-Francois and Sainte Menehould. Mountains and forests are beautifully rendered in profile. Decorative title and scale cartouches in the bottom corners feature cherubs. The title cartouche also includes a coat of arms. World famous for its spectacular sparkling wines of the same name, the region of Champagne was historically bound by the bishopric of Liege and Luxembourg in the north and Burgundy in the south. The map is in good condition with minor wear along the centerfold. Original plate mark is visible. It was at this time that the Dutch controlled the map trade, and their ornate and beautiful maps had immense popularity. Blaeu was instrumental in driving this dominance in his lifetime, and this legacy was continued by his sons. This series was published by his son Johannes c. This is a beautiful example of his work. Binding: Unbound Language: English. Old & Rare Books, Maps & Prints. Since 1925 116 East 59th Street, New York, NY 10022 New York City’s oldest independent book store. Argosy Book Store, founded in 1925, is now in its third generation of family ownership. Our enormous stock of antiquarian and out-of-print items fills a six-floor building in midtown Manhattan and a large warehouse in Brooklyn. We specialize in Americana, modern first editions, autographs, art, antique maps & prints, and the history of science & medicine. We also have thousands of books in all other fields of interest. We are founding members of the Antiquarian Booksellers Association of America, and we belong to the International League of Antiquarian Booksellers and the Appraisers Association of America. The Argosy Gallery, located on the second floor of the book store, has one of the most extensive collections of antique maps and prints in New York City. A small selection of our materials are available online, but these are merely a sampling of the many thousands of pre-20th century materials in our collection. Our materials cover from botanicals to maritime maps and everything in between. Whether you have something specific in mind or just want to take a look around, you’re bound to find something that delights and often surprises you. Authenticity: All items are original antiques, unless otherwise specified. Certificate of Authenticity can be provided upon request. On rare occasions the item you want may be unavailable. Please notify us before returning anything, and make sure the items are carefully packed. Framing and Archival Services: We offer fine custom framing and advise on framing challenges. We provide conservation services for all works on paper as well as conservation storage solutions. 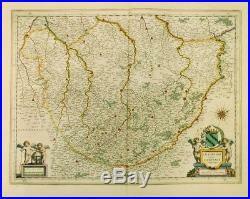 The item “CHAMPAGNE LATINE CAMPANIA Wine Map c. 1640 Willem & Johannes Bleau FRANCE” is in sale since Thursday, June 28, 2018. This item is in the category “Antiques\Maps, Atlases & Globes\Europe Maps”. The seller is “argosy2000″ and is located in New York, New York. This item can be shipped worldwide.